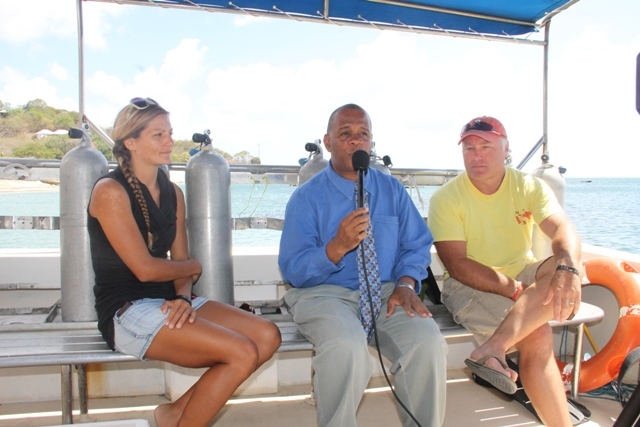 NIA CHARLESTOWN NEVIS (July 01, 2015) – United States of America based marine biologist James Hewlett and Valerie Gregoire of Scuba Safari, in interview on June 25, 2015, for an upcoming NTV8 Eye on Agriculture programme, encouraged marine education and the implementation of a marine reserve to improve the marine life in Nevis. Hewlett Reef a Check Co-coordinator assisted by Gregoire conducted yearly reef checks on Nevis for the past six years. The data collected is analyzed and sent to the Reef Check headquarters in California to be included in their global reef check report. Reef Check is a US based Non-Profit Organization dedicated to empowering people to save reefs and oceans worldwide. He also said that marine education would best assist in improving the livelihood of locals and fishermen. He also urged fishermen to become reef-check certified because it would also benefit the growth of their profession. “ With respect to the fishermen…they are the greatest source of knowledge that exist on any of the islands in respect to the status of the reef. It’s always good to get a co-ordinated effort,” he said. Hewlett stated that although the reefs were in decline, there were positive indicators since the last reef check in 2014. “There are a few things that we are seeing that I think are interesting… We did not see as many Lion fish this year on our site. That’s probably because they are speared off by divers … which is good because you would want to get rid of these. Hewlett expressed that climate change is one of the major contributors to the degradation of the reefs throughout the world because it triggered factors such as acidification of rain, the frequency and patterns of storms and the rise in sea levels and temperatures. Hewlett was accompanied by other members of the Reef Check for two weeks. While on Nevis they also conducted some training for Department of Fisheries personnel.